My new CD Sacred Songs has been released today. Go here or here to purchase, and scroll down for several posts about the disc and the music. Here is the essay poet and critic Susan Stewart generously contributed for the CD booklet. Shapes in air, destined for hearing, poems set to music move in time beyond their silent meters and rhythms on the page. And poems set to music return to the most ancient Western practices of lyric poetry, the expression of a single reciter/singer accompanied by a lyre. 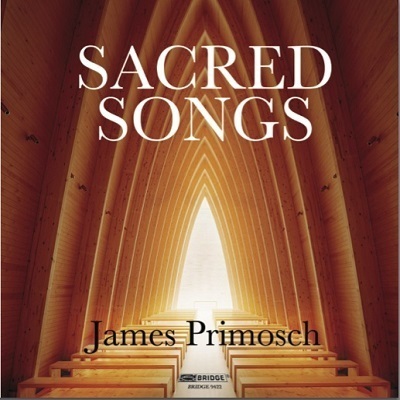 James Primosch’s settings explore in myriad and deeply historical ways the rich possibilities of the form. Although a poet working alone on the page more often than not can hear the sound of the unfolding lyric, a musical setting opens the poems to many new and vivid possibilities of experience and interpretation. Consider how the poem now is full of articulated syllables, slowed and speeded phrases, breath and pause and speech on the margins of whispering, laughing, and crying—all joined by an unfolding musical line that takes the poem beyond mere dramatization. To say the poem “comes to life” in music hardly does justice to the ways the work also comes up against the millennia-long project of augmenting the human voice through instruments made of wood, metal, ivory, and bone. The poem is realized in a world of substances and sounds, formed and informed by generations of musical labor, finding its historical manifestation at last in performance and the reproduction of performance. The poem now lives on as not only a record of the poet’s work, but also as a composer’s score—a new matrix that gives it a double life. And the song continues sweet. Between individuation, difference, and melodic articulation on the one hand and harmony, coincidence, and resonance on the other, the voice and poem find their living form. Here the voices are Susan Narucki’s crystalline soprano and William Sharp’s resonant baritone. As the unique grains of these voices become more and more vividly defined, the listener also is immersed in the universality of texts whose sources range from the Hebrew Scriptures to the present. Throughout Primosch is drawn to works that expound upon musical themes. In the Rilke passage above; in St. Bernard’s praise of Christ as the most “pleasing” topic to sing about, the most “joyful” subject to hear; in Prudentius’s call to angelic praise; and in Denise Levertov’s register of “a gratitude” that “had begun to sing in [her]”, time is both extended and collapsed. Levertov asks in her brief lyric “Was there/ some moment/ dividing/ song from no song?” and she implicitly links the creation of light in Genesis to the creation of song. By weaving his cycles together, repeating poems under new circumstances of composition, varying the texture between written prose, spoken utterance, and lyric interlude, Primosch emphasizes this dynamic of silence and sound as well. The song cycle and poetic sequence are moved by powers of beginning, ending, and beginning again. Rilke’s allusion to the book of hours, the recurring musical references to bells, chimes and other instruments of time marking, the emphasis upon the Christian god of resurrection, themes of dawn and dying make this collection of songs cohere as a single work of art, one which explores the relation between the present moment and eternity. My own work is represented by four texts here. William Sharp sings “Dark the Star” twice, dramatically emphasizing the ways an echo can be a difference and lending new density to the temporal experience of listening. The semantic echo between the two shadow poems, “shadow/Shadow” and “Shadow/Lintel” similarly brings the audience in time across the threshold of the speaker/singer’s changing emotional states. And “Cinder,” a small lyric I wrote as a section divider for my 1995 book The Forest, has, for me, a surprising role in Primosch’s sequence of ecstatic songs “Holy the Firm.” There its collective “we” provides a reflective space for the strong individual emotions of the four poems that surround it. These poems are the first of my works that James Primosch set and mark the beginning of our work together. In later years we have explored other ways of composing song cycles by working individually and then, most recently, together from the first phases of our projects. I am struck that these four lyrics share certain qualities that made them nascent songs before the composer worked with them. They each have a vocal clarity and minimal means; they each are strongly felt. Yet of more significance is the fact that each of these four poems came to me almost fully formed—an experience that is not typical of my usual process of belaboring individual works over many years. In writing both “Dark the Star” and “Cinder”, I was awakened in the night by a sense a poem was forming and, going to my desk, I finished each work within an hour or two of vivid concentration. I have often been struck by how uncanny it was that James Primosch, not knowing this history, unfailingly chose these poems to set. It leads me to believe that some poems are born to be songs–and will become songs once their composer, too, arrives. Susan Stewart’s volumes of poetry include The Forest, Columbarium, which won the National Book Critics Circle Award, and Red Rover. A former MacArthur Fellow, and recipient of an Academy Award in Literature from the American Academy of Arts and Letters, she is the Avalon Foundation University Professor in the Humanities at Princeton University.